No one knows much about Grimgor before he staggered out of the blasted wastes with the Immortulz, his bloody-minded bodyguard. They were tired and hungry, but were Black Orcs nonetheless, and particularly hard ones at that. Even for a Black Orc, Grimgor’s thirst for war was exceptional. 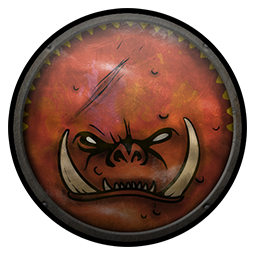 If a single day went by without a battle, Grimgor was known to start camp-decimating arguments, his one good eye blazing with eagerness to find fault and start a good scrap. Two days without a battle and Grimgor would smite anything he could reach, save (perhaps) his fellow Black Orcs. Who knows what would happen if three days without a battle ever occurred? Even scarred veterans tremble just to think of it. This unquenchable thirst for battle is a sign that marks out a Warboss for leadership, a sign that the Orc is favoured by Gork. In a hulking Black Orc with unmatched fighting skills and ferocity, it has marked out Grimgor for greatness; the prophet and harbinger of Gork.